Those of us not blessed with central air conditioning will be dusting off their AC units and installing them in their windows now that we’re entering true summer. If you’ve managed this feat without mangling a toe or a passerby on the street below, congrats, but there’s something else to consider before you cool off in the new breeze: depending on how you’ve set up the unit’s power cord, you might be at risk for setting your home ablaze. 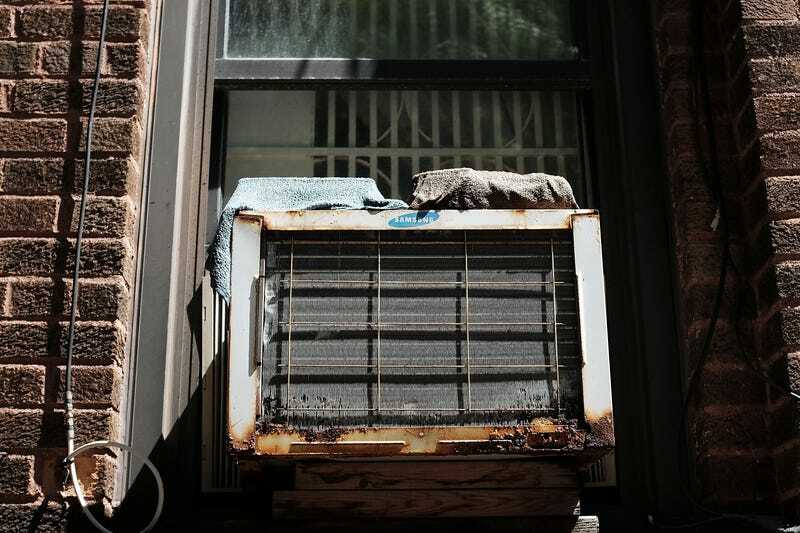 As Gothamist explains, air conditioners draw a lot of current, far more than a television or computer, more than the average extension cord than handle. (Not all extension cords are made equal; they come in different sizes, called gauges, which, along with the cord’s length, determine the amount of current they can safely carry.) No matter how distant your AC is from the outlet, resist the temptation to plug your AC to any old extension cord you have lying around, as it could overheat and start fires. In fact, the FDNY advises against using any sort of extension cord with a current-guzzling appliance like an AC, fridge, or space heater. Poorly chosen or overloaded extension cords and overloaded power strips have been the source of fatal fires in cities like New York, and according to the U.S. Product Safety Commission can be blamed for household fires nationwide. So if your window is too far to plug in a window unit, you should opt for another cooling method, like a fan or a free-standing AC unit that you can maneuver closer to the outlet. Should the layout of your apartment deny you any other option, you could get a heavy-duty extension cord in accordance with the electricity rating listed right on your AC unit or on its instruction manual. If you’re overwhelmed, just bring that information to an electrician or expert at the hardware store who can guide you in selecting the right cord. (If you have other equipment to set up, you can also consult this Home Depot guide for cord selection.) Just get this whole issue out of the way now so you can savor a summer of chilly pillows, and avoid waking up to a fire.